Democracy Now! Iraq War Timeline Recaps a Decade of Independent Reporting on Occupation and Protest | Democracy Now! 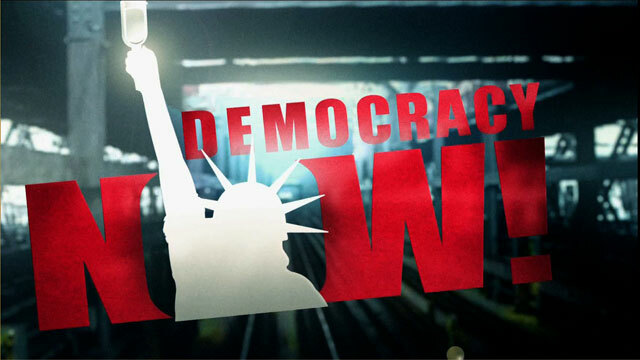 AMY GOODMAN: And we’re joined right now by Democracy Now!’s own Renée Feltz, Democracy Now! producer and reporter. Renée, you put together this timeline. Can you walk our listeners and viewers through it? What will they find if they go to democracynow.org? RENÉE FELTZ: Right, well, Democracy Now! has been around for more than 15 years. For 10 of those years, the nation has been at war. And we tried to encapsulate some of that coverage in a way that was easy for people to access and browse through. So if you go to our website, democracynow.org, go to the landing page there, you’ll see a button where you can click on the timeline. Once you get into the timeline by clicking there, you can scroll through it and look at videos. It begins before the invasion, actually, on February 15th. A lot of people remember the millions who took to the streets to protest. Despite that, the U.S. went to war. One of the interesting videos at the beginning is you, Amy, on Charlie Rose doing a contentious interview, shall we say. You need to go to the website to see it. And it will really help set the scene for the uniqueness of our coverage in bringing the voices of resistance, the voices of Iraqis. If you scroll down to the bottom, you can zoom in or zoom out, see all 10 years, just a few years. And if you move forward a little bit through that towards the end, bring us up to about 2012, when we recently covered a protest against NATO on Memorial Day by Iraq Veterans Against the War. And I know a lot of the Iraq veterans, like the ones we have coming up, were touched by that footage. A lot of people find it very striking. We include voices throughout the timeline like that of Iraq veteran Tomas Young, who we’ll hopefully hear from later this week. He has been through many challenges. His story was featured in the Body of War documentary. So, people should go to our website, democracynow.org. You can use the timeline to browse the highlights of our decade of coverage and watch the videos. It’s all right there, very easy to watch. Now, if you click on the “Read More” link for each of the videos, what it will do is take you to our landing page for that day. And so, perhaps you want to see on some of the early shows all two hours of our coverage—some days we went long—and you can see a very young Jeremy Scahill correspondent. He had just been back from Baghdad at that time, in the early days of Democracy Now!, in some of these shows. So it’s great footage to watch. It takes you back to the time all the way up to the present. And it helps talk about the significant role that we played in the media landscape in this country in the lead-up and during the war. AMY GOODMAN: And, Renée Feltz, thank you so much for putting this timeline together. It is truly priceless. It is a remarkable look at, well, how media, not on bended knee, can cover war. So go to democracynow.org. This is Democracy Now!, democracynow.org, The War and Peace Report. When we come back, two women—one Iraqi, one a U.S. soldier—coming together to look forward, to heal. Stay with us.